In most years, we are blessed with a bountiful harvest. Usually by now we have an overabundance of cucumbers and tomatoes, along with beans and potatoes. In past years we haven't done well with Bell Peppers and have had trouble getting our onions to grow very large. This year is very unusual. The main season tomatoes are very late and we have only had a few good cucumbers. On the other hand, our Bell peppers and onions have been amazing! 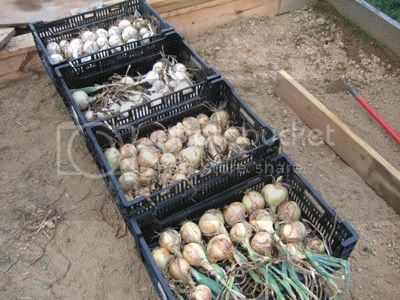 We have well over 100 large onion bulbs drying right now. 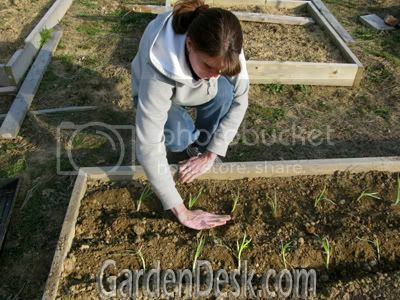 To grow large onion bulbs you need many growing days of warm but not "hot" temperatures. Usually here in Northern Kentucky,our weather is not condusive to growing large onions because we typically go quickly from a cold Spring to a hot summer. This year has not been typical. Our Summer has been unusually cool. July 2009 is now officially the coldest July ever recorded! Our "normal" average high temperature for July is 85 degrees. This year's average was 69 degrees. That kind of weather is not great for growing tomatoes, but oh how the onions love it! And of course we love the onions! I guess in a way the vegetable garden is like the stock market - it pays to diversify. The other vegetable that has been unusually great this year are the Capsicums. The weather explanation doesn't fit here at all. I do have a theory about why we have harvested about 75 large peppers from one 4'x12' bed. I will share that theory and some pepper pictures in my next post. Recently my wife and I got to transplant our onion plants outside in two of our raised beds. We are growing two different onion plants this year. 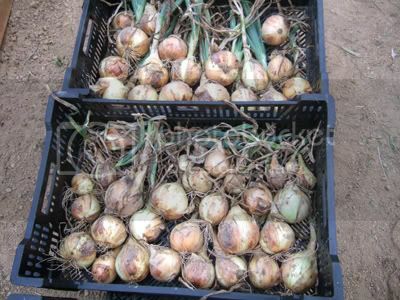 Walla Walla is a yellow skinned large sweet onion and Superstar is our large mild white onion. Both are supposed to do well even in the north. 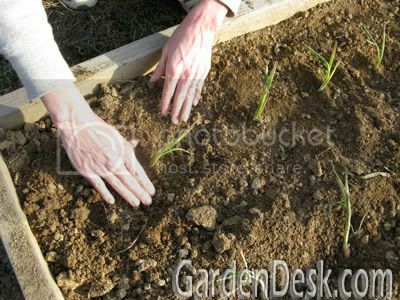 We will be planting various onion sets as well when we plant out the tomatoes and beans. We also have two types of leeks still growing inside under the lights (Carentan and Giant Musselburgh). 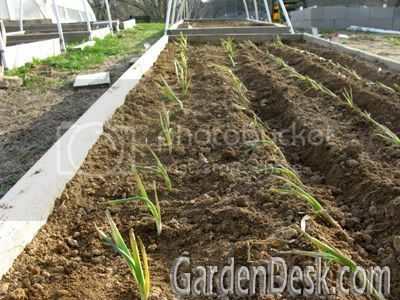 To round out the Allium family, we have potato onions and several types of garlic that we planted in the fall. 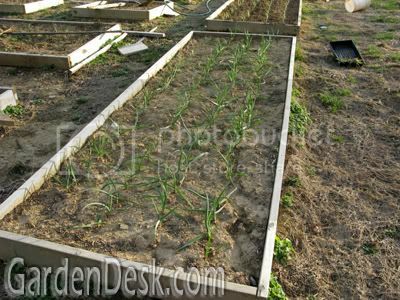 The large onion bed is right next to one of the garlic beds. The garlic is growing very well. If it weren't for all of these Alliums, the vegetable garden would still be pretty empty. Soon they will be joined by peas lettuce and cabbage. Then later comes the many warm season veggies. I can hardly wait!